"HP has just announced a new all-in-one, space saving, clutter-free PC designed for small businesses. 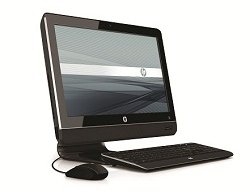 Called the HP Omni Pro 110 PC, this computer places all the internals of the computer into a 20″ widescreen." This looks like HP's answer to the likes of Lenovo's M90z; an all-in-one computer design tuned for office use. I used to be fairly negative on the all-in-one concept, but since testing the M90z my stance has changed: unless you specifically have plans to upgrade your computer over time, there's literally almost no reason to go with a desktop computer. They're bigger, usually noisier, and don't offer many advantages beyond being able to upgrade them. That said, in my office I have three desktop PCs that are in near-constant use, and I wouldn't replace any of them with all-in-one designs. I deeply value the ability to upgrade and modify my desktop computers - and also the ability to use whatever monitor(s) I wish.